So it is officially public news. My brother will have his first offspring in April of 2013. My SIL is thrilled that both my mother and I know how to play with yarn, so now I get to make lots of little fun things. 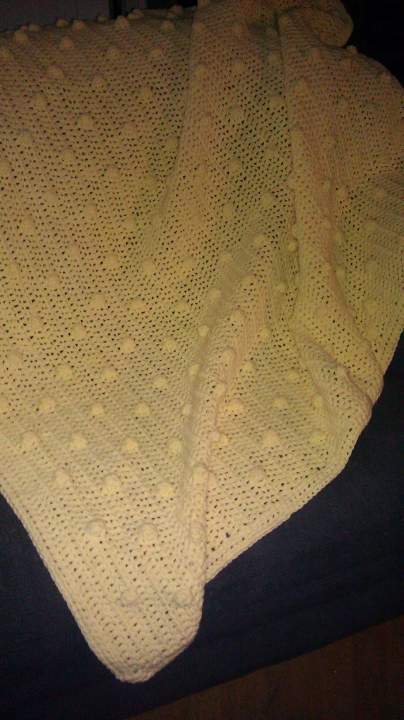 Here’s the first blanket I finished–pardon the horrid photo, but I had to take a quick photo before boxing it up. Crochet with Baby’s First by Lion Brand in Honey Bee, I think that it took about 14 skeins of yarn to finish. Insane! But it’s all cotton, and it turned out almost 3.5′ square. I love the bobbles on it because it’s something for the baby to play with while on the floor as they start to reach for things, and I love the fact that it’s all cotton because with my SIL being the crazy cat lady she can throw it it the washer at any time to remove cat hair. Fun times! Next for me to make is the Noah’s Ark blanket, but that one is a surprise…. Several years ago, I went back to school. Until that time, I did not have a computer. I figured that since I was at work for 9-10 hours per day, sitting in front of a 17″ screen, there was no need for me to have one at home. In order to submit my homework and participate in the online requirements, I needed to cave and buy a laptop. So I did. I called a friend of mine who owned his own business, working with computers and supplying them to others. And I purchased a computer. It worked great for what it was–a tool for my graduate degree, and (of course) a portable jukebox with all of my music. About a year ago, I started to notice that the cord was fraying. Plus, the unit itself would overheat drastically if I wasn’t careful and cut off. Soon I noticed that the power source was sparking against my left leg as I worked, so I went and bought a universal adapter (at the cost of $100, natch) to use. after about six weeks, THAT cord didn’t work so I returned it and bought another one. Same problem–the joint didn’t hold and I had issues with the replacement AGAIN. So I called the guy that I bought the computer from. He came and picked it up and tried to ‘fix’ it. Yeah, that didn’t work. Six weeks later I finally got him to give me the hard drive back so that I can access my music and, most importantly, my contact information. Since then I have been sans laptop. I have an old desktop in the back bedroom, and that is what I have been using for my job search and correspondence for the last two months. But it’s slow, and inconvenient. Not to mention the AC doesn’t circulate back there, and whenever the door is open the cat leaps at the chance to go destroy the chair that is in the bedroom. It’s weird. I had gotten into the habit of checking email, Facebook, and blogging while in front of the TV. I miss being able to do that–I feel like I am wasting a ton of time by stopping everything to go back into the back bedroom and work. I miss being able to pull up actors on IMDB so that I can instantaneously answer “where have I seen them before?”. I miss being able to write on my prayer blog every day, because it is not something I take the time to do in the back room. At the same time, I have noticed tonight that there is quite a bit I haven’t done. For tonight, for just the night, I have swiped my laptop from work and am using it for personal reasons. I have work to do tomorrow, but I am currently trying to do personal stuff, mostly just because I can. I haven’t done laundry, I haven’t done dishes, I haven’t cleaned my house, I haven’t finished making a baby sweater for the same guy that sold me the laptop as they just adopted a baby girl. This just solidifies the fact that I need to get another laptop. Quicker than planned. And it’s going to be a Mac this time, as I cannot stand to deal with the problems IBM is giving me again. And if the laptop has made me unproductive, just wait until tomorrow when I get my new TiVo…..